Relax in elegance at this Belfast hotel's idyllic downtown location. 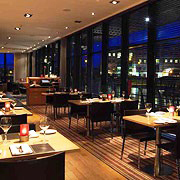 The Radisson Blu Hotel, Belfast provides guests with the unique blend of relaxation and convenience. Situated on the banks of the River Lagan in the smart green grounds of the old “Gasworks”, you can enjoy the peace and quiet of being off the main road with the convenience of city centre location. 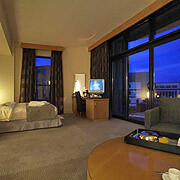 Combining first-class accommodation with a cosmopolitan style, this modern hotel ensures guests a unique stay. Steps from this Belfast hotel, guests will discover thrilling cultural experiences and historic attractions, including the newly refurbished Ulster Museum, Belfast's Grand Opera House and Botanical Gardens. The Radisson Blu Hotel, Belfast sits within walking distance of top attractions including the Odyssey complex, W5, Waterfront Hall, Ulster Hall and City Hall.Sample some of the finest shopping at Belfast Victoria Square Shopping Centre located within easy reach of the hotel. The hotel features 120 guest rooms designed in unique style and offering luxury amenities for a comfortable stay.This Belfast hotel's Suite 7 is the largest suite in the city and boasts impressive views of the city skyline. Filini Restaurant features creative seasonal menus of sumptuous Italian and Sardinian cuisine to be enjoyed overlooking the external water feature.Free, high-speed wireless Internet is available throughout the hotel. Five versatile meeting rooms with state-of-the-art presentation technology ensure a flawless event in city centre Belfast. The hotel's chic and modern wedding facilities can accommodate up to 90 guests. The hotel is within easy reach many good golf courses, sporting venues such as Windsor Park, Ulster Rugby at Ravenhill and Belfast Giants at the Odyssey Arena.